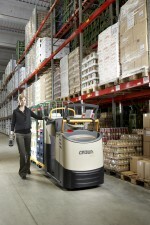 CROWN, one of the world’s largest material handling companies, recently gained its fourth award for the GPC 3000 order picker with QuickPick Remote by winning its 14th GOOD DESIGN Award from the Chicago Athenaeum: Museum of Architecture and Design and The European Centre for Architecture Art Design and Urban Studies. Crown says by honouring the innovative remote glove technology for order picking, the award programme’s jury has recognised the company for its dedication to design that challenges traditional thinking. Crown says its approach to design focuses on ideas for improving lift truck operator productivity and safety, based on a thorough understanding of the operator-forklift relationship.